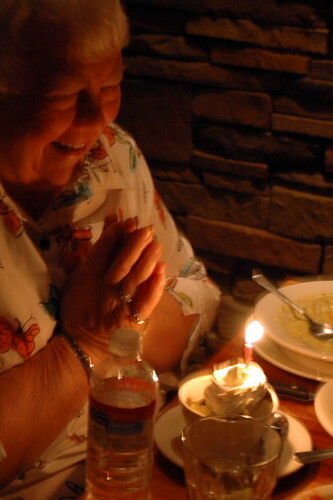 On Friday, my Mamo turned twenty-sixty. She's one of those terribly hard to buy for people. She has what she needs and what you buy her probably isn't going to be right. So this year, we all decided we'd try to get everyone together for her birthday. And by some miracle we managed it. Well, mostly. 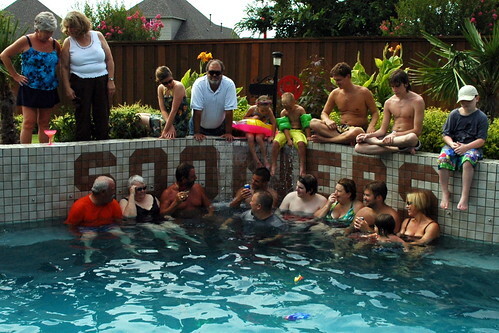 All the sons, daughters-in-law, grandkids and great-grandkids, anyway. We're a ridiculous bunch. Full of beards and immaturity and even a Speedo. And somehow, I think Mamo liked it. Click on the photo below to see more pictures of this soggy bunch. Congratulations to Mamo. I love the tile work in the pool shot.